Nancy: We first met at a quilt show many years ago where you were representing your line of fabric. I was completely drawn to the beauty of your prints and immediately knew I had met someone I would like to call a friend. I have wanted to collaborate on a project with you ever since and finally I am delighted that you have agreed to let me help you create this wonderful coloring book. Nancy: Would that first meeting have been at Quilt Market? How many fabric lines have you designed, for what companies, and in what years? Diane: I remember meeting you and liking you instantly! I believe our first time we met was at Quilt Market in Houston. We then met again at the Quilt Show in Rochester, New York. I was surprised to see you again. We were exhibiting at the same show! My first fabric line was with Erlanger Blumgart in 1995. At that time my designs were simplified and repainted by hand and done by hand in repeat. The next company I designed fabric for was P & B Textiles in Burlingame, California. I hand-painted all the designs, even doing a design right in their studio when they needed one more! I did fabric for E. E. Schenck of Portland Oregon next. We took designs from my Spring and Summer paintings. We focused on my Spring Garden painting and recreated the flowers and trees in repeat patterns. I did several fabric lines for Elizabeth Studios in Milltown, New Jersey. They did a wonderful Spring collection followed by a Winter and Autumn collection. I loved designing fabric and am now looking for a fabric company to work with to do more fabric lines. My collectors of my art ask me all the time for more fabric! Nancy: I read in one of your two quilt pattern books (still available on Amazon.com) that you have never made a quilt. Is that still true? So someone else wrote those patterns on your behalf? 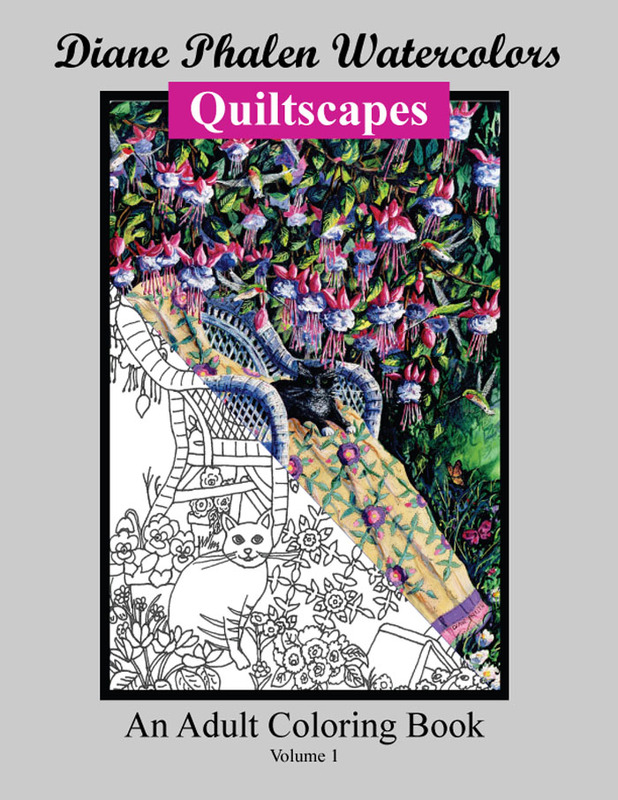 Where do you get the designs for the quilts you use in your paintings? Diane: No, I have never made a quilt! I always loved quilts and was fascinated by the colors and the patterns. I worked with several quilters in writing the patterns. Some of the patterns are from my Grandmother’s quilts and traditional patterns. Some patterns I designed on my own. When I first started drawing I would doodle and fill in colors of patterns. One of Diane’s former fabric lines – now sold out. Nancy: Did you attend college and if so where and what degree(s) did you earn? When you finished school, what did you envision yourself doing for a living? Diane: I did attend college! I moved to California when I was 26 to go to College. It was free to attend the Community colleges there. I attended Diablo Valley College in Concord, California. I wanted to take art but was encouraged to take engineering classes. I took drafting and mechanical design. I worked full time attending classes in the afternoon and evenings. I worked drafting for Mare Island Shipyard. I did drawings of the Navy ships and submarines. I decided to go to San Jose State College. I moved to San Jose, California and worked full-time for FMC Corporation doing welding drafting on the Military tanks! I loved my time in California. I never got my full degree. I was in an auto accident and took time to recuperate. I also married my husband, Mike. He encouraged me to do my art full-time. I worked at Amdahl Corporation before making the transition. At Amdahl I was introduced to the beginning of CAD (computer aided design). After I married Mike we moved to Oregon. We wanted a house and some land. We lived on 17 beautiful wooded acres surrounded by woods. My studio was in the woods. I loved it! We eventually opened a Diane Phalen Watercolors storefront in downtown Banks, Oregon. Sadly, my marriage to Mike ended after 22 years. I moved back to Pennsylvania to be closer to my parents and sisters. Nancy: So you grew up in Amish country in PA? Was that part of the inspiration for your career goal? Diane: I did grow up in Pennsylvania and love being close to Amish Country and seeing the dramatic seasons once again. I do some painting of my memories of California. I still paint Oregon too, especially the snow-capped mountains. I do miss the West! Nancy: Thank you Diane for all the inspiration! This entry was posted in QuiltWoman, Uncategorized and tagged Quilt Market, QuiltWoman, QuiltWoman.com. Bookmark the permalink.